Our Aigas guests will be familiar with what we call the Early Morning Run (EMR). 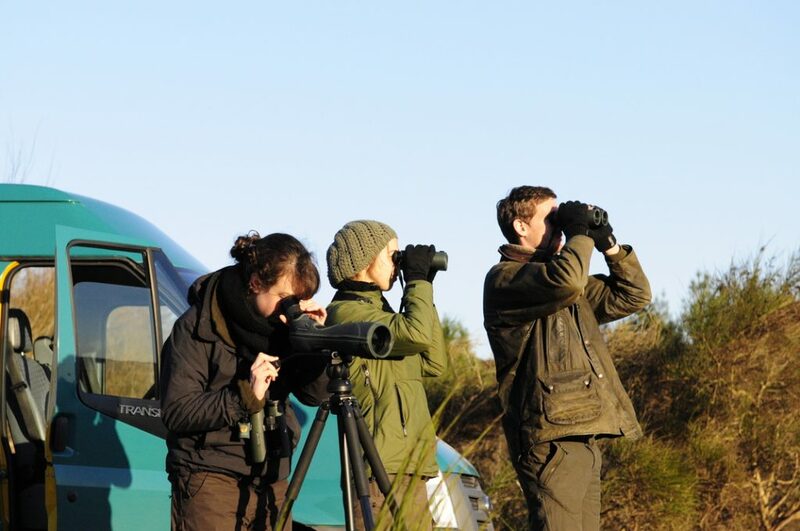 At the beginning of the season, we offer guests the opportunity to visit a black grouse (Lyrurus tetrix) lek and otters (Lutra lutra) later in the season. Black grouse or Coileach Dubh in Scottish Gaelic, participate in courtship behaviour known as lekking where males (blackcocks) congregate display competitively, in attempt to capture the attention of the on-looking females (greyhens). 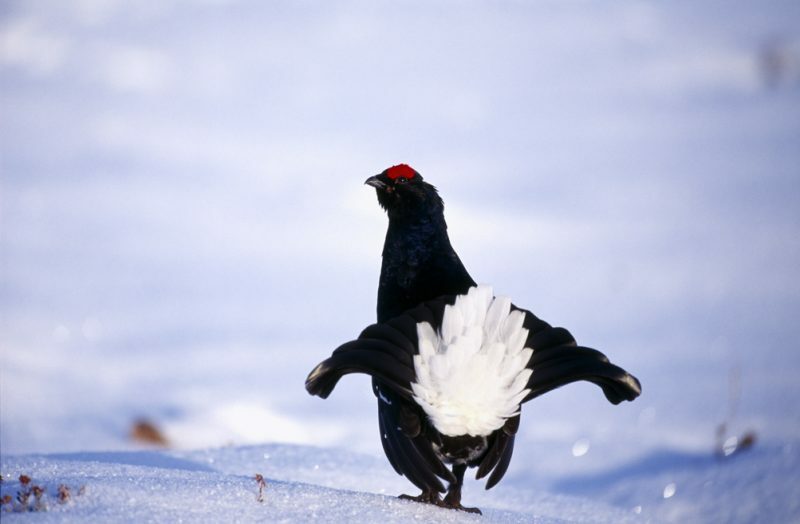 Black grouse are commonly mistaken for and are related to Capercaille (Tetrao urogallus) – the horse of the woodland, which also participate in leks but are much larger in size, and now incredibly scarce in Scotland. The dominant male is usually positioned in the centre of the lek and tends to be more successful in attracting females, while the subordinates or youngsters will be positioned further away. The word lek comes from the Swedish word leka meaning to play and commences in early spring. Lekking behaviour displayed by males includes: defending a territory, mating calls (bubbling and screeching), strutting, tail fanning, jumping and airborne fights, flying over the lek, and charging. In addition to mating displays, the male appearance is more extravagant than the females for sexual selection. Males are black with a white undertail and red wattle above the eye whereas females are brown with speckles. 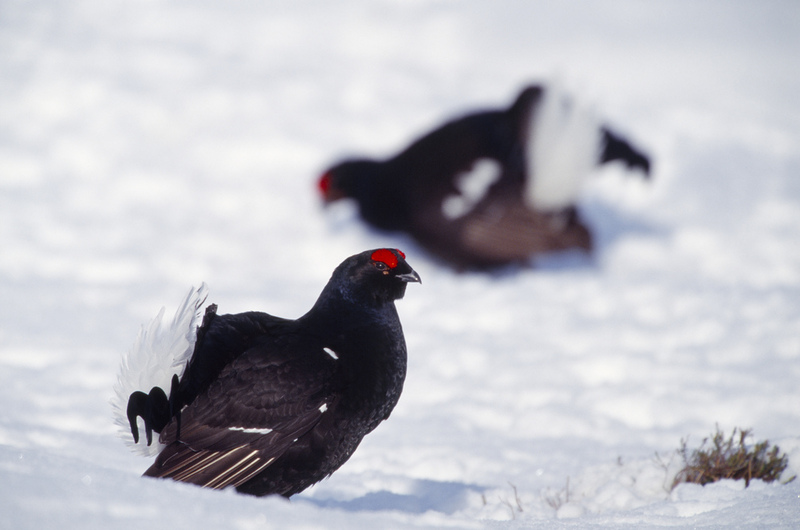 Upland habitats are preferred by black grouse, and lekking sites are often located in areas such as forest edges or open moorland, where there is little cover so that males can be seen and heard clearly by the females. This can increase their vulnerability to predation. While the males carry out their displays the females remain in cover watching and selecting the best male. It is thought that lekking success can also depend on the size of the lek, with larger leks attracting more females. In the United Kingdom, lek sizes average between 5-10 males but numbers can reach over 30 throughout Europe. Only a few of the males will copulate; there are no paired bonds formed and males take no part in rearing the chicks. What do Aigas rangers do on their days off? Recently, some of us partook in a black grouse count, which is important for determining the population size and dynamics. Counts involve either walking along transects or remaining positioned for a period listening for calls and observing. We rose from our beds at 3:15am to travel to the potential lek sites, armed with our coffee flasks and warm clothing. On arrival, we divided into separate smaller teams to survey wider areas. Ben and I were situated in a vehicle and had a wonderful view of the sunrise, but no active signs of the black grouse. 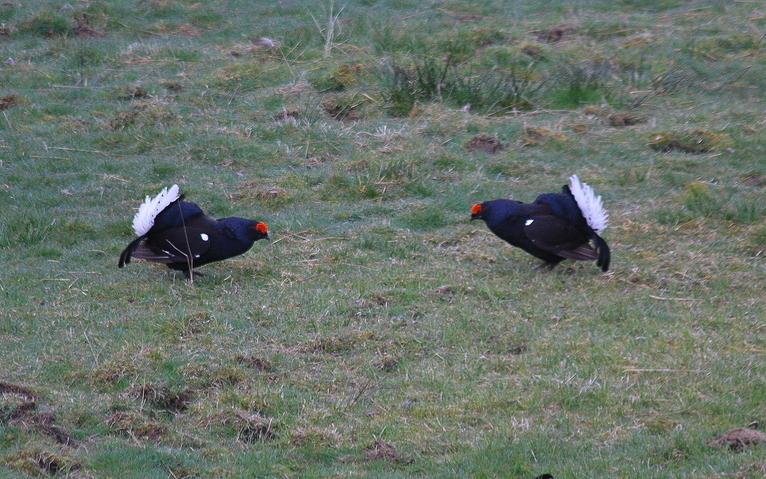 Kerri on the other hand had a clear view of black grouse on a popular lekking site with approximately 10 individuals. 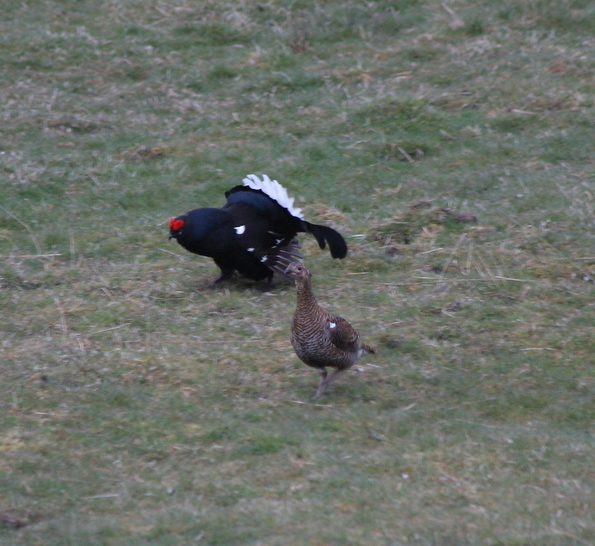 Counts were recorded every 5-10minutes, and it was becoming increasingly unlikely that black grouse were present. I then detected what I thought was the distinctive bubbling call of a male; at first Ben could not hear the calling and I began to believe it was wishful thinking, but as we listened closer the calls gradually became clearer. A merlin (Falco columbarius) flew over our survey area which silenced the calling grouse for a period, however we could still confirm there were black grouse present and were rewarded further with our first sighting of willow warbler (Phylloscopus trochilus) this year. Half-way through the count, a female flew across the moorland in front of us and then disappeared into the heath. Another was flushed her hiding spot, flying into the trees a few moments later, it was unclear as to what had disturbed her. Occasionally we caught a glimpse of the females flying from heather to trees and scuttling across the open moorland. We were able to spot one male strutting across the lek before vanishing into the undergrowth. The bubbling calls eventually returned, but the callers they belonged to were well covered; it would be a bizarre sound to hear if you did not know to whom it belonged. The number of individuals varied between sites, with some surveyors having consistent numbers while others saw fewer to none. Afterwards, we returned home for breakfast and a long nap. We were pleased that the data revealed an increase in the local population compared to previous years. 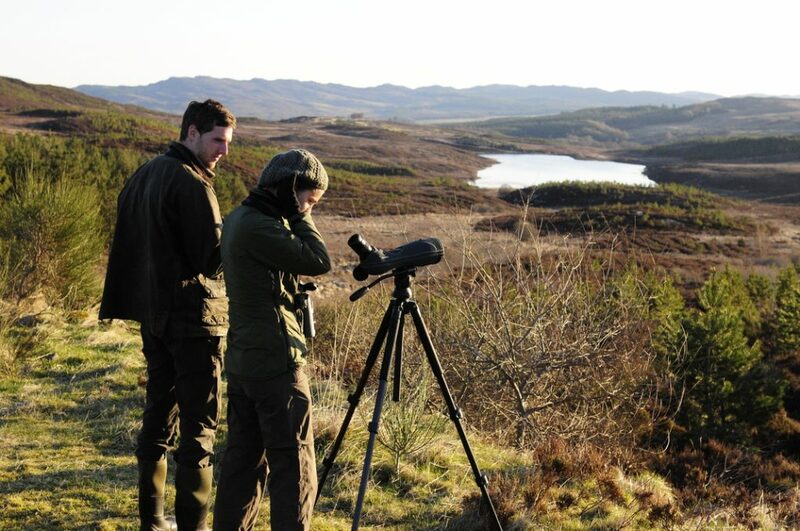 Our guests often remark on how amazed they are to see these birds; for some it is their first sighting of black grouse and often exceeds their expectations. It is truly extraordinary to experience something so unique; you simply cannot beat waking up with the Coileach Dubh.